April 27th airing of Open Source RVA accompanied by people from Girls Rock! RVA and Richmond Reproductive Freedom Project. Long after the race has come and gone, Richmond’s thriving bike culture will still be there—sharin’ your roads, deliverin’ your dinner, gettin’ you fit. Excerpt from the article below, read the full article here. …Located in Scott’s Addition, Rag and Bones shares a great deal of ground with aforementioned organizations, but has situated itself squarely in a gap in bike culture; volunteer Phil Cunningham says that’s exactly the goal. 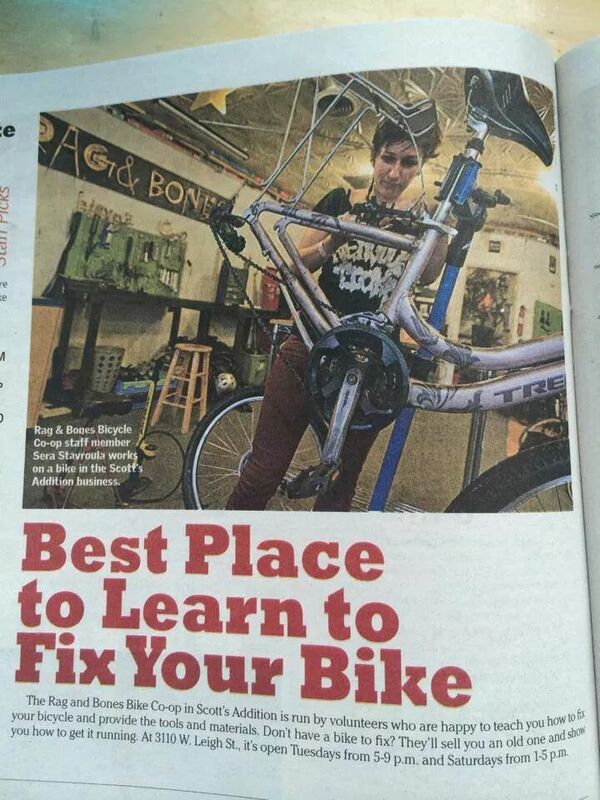 When I first meet Phil, he is hunched over a workbench, teaching a VCU student how to change an inner tube. I wait and observe him demonstrating, then watching as the student attempts on her own. She succeeds and he approves excitedly as he walks over to greet me. Phil tells me that he began frequenting Rag and Bones during his second year at VCU. After hearing about the local co-op, he brought his bike over to have some work done. Soon, he found himself not just getting his bike fixed, but learning how to do the work himself. “I guess I kept coming back at first because I kept messing up my bike,” Phil says with a smile, “Then I hung around because I enjoyed the sense of community I found there.” The co-op, which began in 2010, aims to provide equitable access to cycling. That means empowering others through the knowledge of bike maintenance, Phil says: “The main goal is to fill that gap, to create an inclusive space that particularly reaches marginalized groups.” The co-op currently has open hours–during which you can buy bikes, rent workspace and tools, and learn from volunteers–on Tuesdays from 5:00 to 9:00 PM and Sundays from 12:00 to 5:00 PM. Below are quotes from an earlier article in Style Weekly titled ‘Changing culture, one bike at a time‘. Watch Mark Holmburg feature the bicycle parade below, which many of our members participate in. Watch Mark Holmberg feature the Bicycle Parade that many of our members participate in.